Cindy of Cindystar is the host for Bread Baking Day #52. She came with the great theme: baking French bread. We started immediately to look on the Internet for French bread. I say ‘we’ because Peter, my husband, is also involved in baking bread. He doesn’t only eat all the breads I bake, he especially likes to help choose a bread for Bread Baking Day. 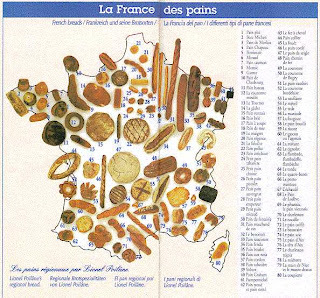 So we found a lot of French breads to choose from. 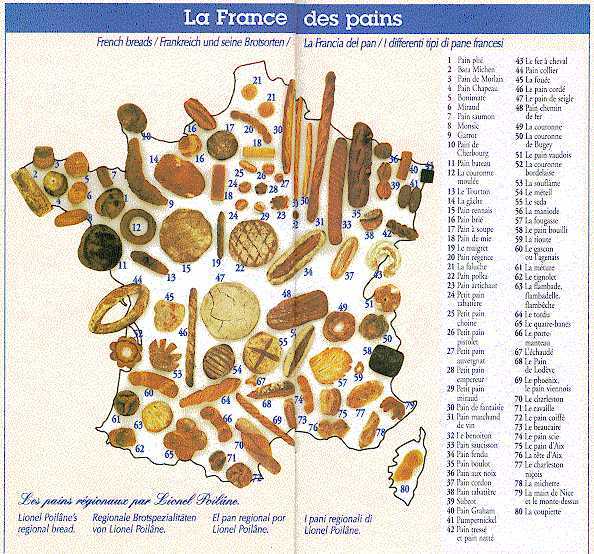 Also we found a nice map full of French breads. As soon as I saw Couronne Bourdelaise or Crown of Bordeaux I knew “that’s the one I want to bake”. At least try to shape it. 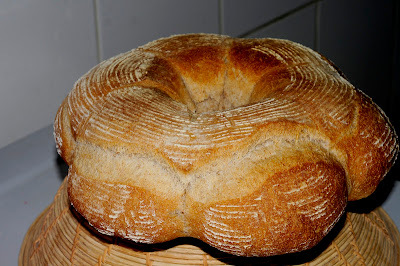 A long time ago I found a great explanation by Susan of Wild Yeast on how to shape a Couronne Bourdelaise. Before I baked this crown I made Cheese and Salami Rye Bread. I was inspired by Weekend Loafer. I was very happy with the whole wheat levain she used. And decided to use the same levain. For the rest of the dough I used Susan’s Norwich Sourdough with a small change. I added gluten; 2% of the flour as an experiment. The next morning we ate the crown and we loved it. Probably because of the whole wheat in the starter we didn’t taste the sourness of sourdough. We enjoyed the chewiness and crusty crust. It’s definitely the most eatable crown I ever made! Adapted from Bread: a Baker’s Book of Bread and Recipes by Jeffrey Hamelman and the levain is from Daniel Leader’s Local Breads. This what I used, I managed but a lower bowl would be better! Stiff Levain: the evening before (8 - 12 hours) I mixed the ingredients for the stiff levain. I left it in a plastic container with a lid for the night in my kitchen. It’s probably warmer than the 21°C in our house. Baking day: The next morning after about 10 hours I placed the levain in a cool box until I was ready to use it. This gave me just enough time. The final dough: I added all of the ingredients, except salt and the levain, in the mixing bowl of a spiral mixer and mixed until all was well combined. I placed a towel on the bowl and left it for 1 hour autolyse. I mixed on low speed for 3 minutes and on second speed for another 3 minutes or so. The dough should have moderate gluten development. Bulk Fermentation: transfer the dough to a slightly oiled container, cover and leave for 2 1/2 hours. Stretch and fold the dough two times at 50-minute intervals. Shaping: I divided the dough into 6 pieces of 100 gr each and 1 piece of 150 gr. The rest I used for pizza. Shape the pieces lightly into balls, cover them and let them rest for 20 minutes. Flour your basket and place the bowl into the basket. Here is where I had to be creative. My bowl was too high; I couldn’t place the dough over the bowl. Instead I placed the dough on the bottom, cut the dough with six points and centered them over the balls. Then I placed the bowl back in the centre of the crown. Since the bottom of my basket was smaller the balls already touched each other. Proofing: I placed a moist towel on the basket and covered it with a plastic bag. I proofed the crown for 1,5 hours. Pre heating: I pre heated the oven to 230°C and placed the steam pan with stones on the bottom of the oven. Preparing and Baking: When the oven is hot enough I boiled water and pour it in a glass bottle with a long neck. I pour some boiling water on the hot stones and quickly close the oven door to keep the steam in the oven. I placed the crown on parchment on a peel. In her explanation Susan wrote “The “collar” look like it has glued itself to the balls (and it has), but it should pop up during baking. No slashing required!” Unfortunately my ‘collar’ was ‘glued’ on strongly and only two balls popped up. I have no idea why, do you? Transfer the crown to the oven and quickly slide on the baking stone. After some minutes I sprayed a little bit water to get more steam. I baked the crown 10 minutes with steam and quickly removed the parchment paper and the steam pan. I baked the crown for another 25 minutes. By then it had a nice brown color. Cooling: Let the crown cool completely on a wire rack. Thanks Heather, it's always a pleasure to see your nice comments on my posted breads. The method started with Susan, who has a great photo explanation, did you see it? I had to improvise on the size and shape of the basket. My post on Cheese and Salami Rye Bread is coming soon! And I likevery much the map, think I could add it to the round up, may I? Thank you Cinzia, you're welcome for some slices because it tastes great. As always an incredibly well written and informative and creative post. Thank you, you are inspirational! Thanks Michelle for your kind compliments.